Building on an already amazing year -- and career -- last night Phil Hellmuth further secured his place in the World Series of Poker record books by winning the 2012 WSOP Europe Main Event. 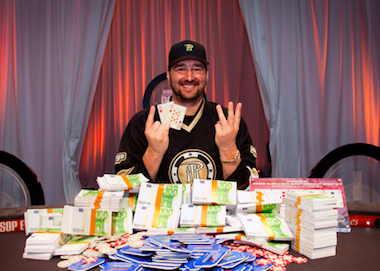 Hellmuth topped a tough field of 420 players to win his 13th career bracelet and the €1 million-plus first prize. The victory also catapulted Hellmuth into first place in the 2012 WSOP Points of the Year race with only the WSOP Main Event final table left to go. Following last week's recap of the results from Event No. 1-4 at the 2012 WSOPE, here's a rundown of how the final three events went, along with the non-bracelet €50,000 Majestic High Roller tournament which drew some attention as well this week at the Casino Barrière de Cannes Croisette in Cannes, France. Event No. 5: €10,450 NLHE Split Format The uniquely-formatted Event No. 5, a.k.a. the "mixed max" event, attracted 96 entrants (down from last year's 125), who began with full-ring nine-handed no-limit hold'em, then moved to six-handed NLHE, then with 16 left played the tournament out as a single-elimination NLHE heads-up tourney. In the end it was Jonathan Aguiar emerging with the bracelet and more than quarter-million Euro first prize. Aguiar's road to victory wasn't easy. After making it to the final 16 with an above-average stack, Aguiar had to overcome Jason Mercier in the Round of 16, Marvin Rettenmaier in the quarterfinals, Faraz Jaka in the semis, and Brandon Cantu in the final to win. Cantu courted controversy in both his semifinal match versus Event No. 3 champ Roger Hairabedian and the final with Aguiar. After voicing several complaints about rulings in the earlier match with Hairabedian, Cantu was frustrated again when the completion of the final match with Aguiar was extended an extra day to avoid conflict with the start of the Main Event. In addition to Mercier, others making the Round of 16 and losing for a min-cash of €20,443 included Mike Watson, Bertrand Grospellier, Phil Hellmuth, and Jennifer Tilly. Here's a look at the payouts for the top eight: Event No. 5 (€10,450 NLHE Split Format) payouts: 1. Jonathan Aguiar -- €258,047 2. Brandon Cantu -- €159,459 3-tie. Roger Hairabedian -- €86,087 3-tie. Faraz Jaka -- €86,087 5-tie. Konstantin Puchkov -- €42,094 5-tie. Marvin Rettenmaier -- €42,094 5-tie. Martin Jacobson -- €42,094 5-tie. Kristijonas Andrulis -- €42,094 Event No. 6: €1,650 Pot-Limit Omaha In Event No. 6 it was Francisco Da Costa Santos -- like Aguiar from Portugal -- grabbing the gold. Santos emerged as the winner from a field of 206 players, a turnout that again was sharply down from the 339 who played in the similar buy-in PLO event in 2011. Just 21 players cashed in this event. Among the familiar names making the money yet falling shy of the six-handed final table were Jamie Pickering (21st, €2,774), Daniel Negreanu (19th, €2,774), Dan Smith (17th, €3,752), John Monnette (14th, €3,752), Dan Shak (13th, €3,752), Mike McDonald (11th, €5,103), and Andy Frankenberger (7th, €9,596). Santos began the final table in second chip position behind Andrew Lichtenberger, but by the time he reached heads-up play he enjoyed a big lead over his lone remaining opponent, Ana Marquez of Spain. Soon after they began their duel Marquez was all in before the flop with As-Ks-10d-5d versus the 10s-9c-7d-6d of Santos. The community cards then came 8d-5h-7c-2d-4h to give Santos a straight and the title. Event No. 6 (€1,650 PLO) final table payouts: 1. Francisco Da Costa Santos -- €83,275 2. Ana Marquez -- €51,443 3. Aku Joentausta -- €36,351 4. Petteri Kalenius -- €25,831 5. Andrew Lichtenberger -- €18,463 6. Nikolay Volper -- €13,273 Event No. 7: €10,450 NLHE (Main Event) Like the other six events at this year's WSOPE, the Main Event also saw a decline in numbers with just 420 turning out after 593 participated in 2011. However as in past years, the small field was especially stacked with top talent, thus making for an exciting week's worth of poker. The top 48 finishers divided the €4,032,000 prize pool. Among those making the money were Justin Bonomo (48th, €20,150), Daniel Negreanu (43rd, €20,150), Eugene Katchalov (40th, €21,250), 2011 WSOPE Main Event champion Elio Fox (39th, €21,250), Bruno Fitoussi (35th, €21,250), Philipp Gruissem (29th, €22,982), Bertrand Grospellier (25th, €22,982), Andy Frankenberger (22nd, €26,611), Liv Boeree (18th, €26,611), David Benyamine (15th, €32,256), Steven Dannenmann (12th, €52,416), Scott Seiver (10th, €66,528), and Timothy Adams (9th, €66,528). Hellmuth had the chip lead when the eight-handed final table began, and managed to maintain it for much of the final day of play while tough opponents hit the rail including Jason Mercier (in eighth) and Joseph Cheong (in fourth). Heads-up play between Hellmuth and Sergii Baranov began with the "Poker Brat" enjoying a better than 3-to-1 chip lead over the Ukrainian, and it would only take a little over half an hour before Baranov was all in with As-4c against Hellmuth's Ah-10d. The board ran out Jd-9h-5h-Ad-3c, and Hellmuth had prevailed. Hellmuth becomes the first player ever to win both the WSOP Main Event (in 1989) and WSOP Europe Main Event. He also extends his record WSOP bracelet total to 13, now three ahead of Johnny Chan and Doyle Brunson who each have 10. The victory also means Hellmuth has moved into first place in the 2012 WSOP Player of the Year standings, thanks to several other cashes including a victory this summer in the $2,500 razz event. Hellmuth's only remaining challenger for the POY title is "Octo-Niner" Greg Merson who must win the WSOP Main Event later this month to overtake Hellmuth. Event No. 7 (€10,450 NLHE ME) final table payouts: 1. Phil Hellmuth -- €1,022,376 2. Sergii Baranov -- €632,592 3. Stephane Albertini -- €423,360 4. Joseph Cheong -- €292,320 5. Christopher Brammer -- €207,648 6. Paul Tedeschi -- €149,184 7. Stephane Girault -- €108,864 8. Jason Mercier -- €84,672 €50,000 NLHE Majestic High Roller Finally, a three-day, big buy-in "High Roller" event added a little more excitement to the proceedings this week in Cannes -- and a huge payday for the winner, Mike Watson. A total of 49 players participated, with 11 taking rebuys to create a big prize pool of €2.88 million. Only the eight making the final table made the money, with Watson ultimately defeating John Juanda heads-up to claim an even €1 million first prize. €50,000 NLHE Majestic High Roller final table payouts: 1. Mike Watson -- €1,000,000 2. John Juanda -- €600,000 3. Richard Yong -- €400,000 4. Philipp Gruissem -- €275,000 5. Tobias Reinkemeier -- €200,000 6. Jani Sointula -- €160,000 7. Steve O'Dwyer -- €130,000 8. David Benefield -- €115,000 Join Betfair Poker Now. Hellmuth becomes the first player ever to win both the WSOP Main Event (in 1989) and WSOP Europe Main Event. He also extends his record WSOP bracelet total to 13, now three ahead of Johnny Chan and Doyle Brunson who each have 10. The victory also means Hellmuth has moved into first place in the 2012 WSOP Player of the Year standings with only the WSOP Main Event final table to go.